MdPHA is counting down Nine Days of Happiness to help kick start or advance your goal of more involvement in our democratic process. It is on all of us to make this thing work, but it can be overwhelming. You have to start somewhere, so join MdPHA in making a difference! 1a. This part is easy. Download and review MdPHA’s legislative priorities. Pick one that speaks to you or choose another issue that is important to you and make it your personal priority. 1b. This part is harder and is why this is a “challenge.” Call your Maryland Senator and Delegate and ask them to co-sponsor the Prescription Drug Affordability Initiative (one of our top priorities). You can find out who represents you here. Post the outcome of your call or any other work you’re doing on our Facebook page to keep the conversation going. You can also send us your stories to advocacy@MdPHA.org or join our Advocacy Committee for regular updates and more opportunities to get involved. 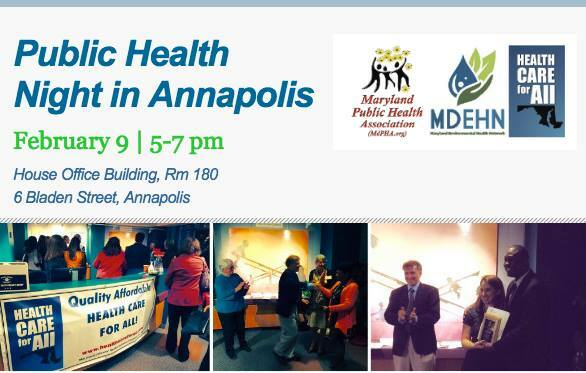 Public Health Night in Annapolis 2017! Please join us Thursday, February 9 in Annapolis from 5-7PM! Come discuss public health challenges with policy makers and fellow advocates. RSVP to advocacy@MdPHA.org. Health Care, Public Health, and Environmental Health Celebration in Annapolis! RESCHEDULED! Please join us on Monday, February 29, 2016 in Annapolis for our Health Night Celebration! EVENT POSTPONED DUE TO WEATHER CONDITIONS! PLEASE STAY TUNED FOR RESCHEDULED DATE!! On January 26th, 2016, the Maryland Public Health Association (MdPHA.org), the Maryland Environmental Health Network (MdEHN.org), and the Maryland Health Care for All Coalition (healthcareforall.com) invite you to join our annual discussion with Maryland legislators about public health and environmental health issues. From 5-7PM in the Miller Senate Office Building (11 Bladen St, Annapolis 21401), you will have the opportunity to mingle with your fellow public health professionals and legislators from across the state to discuss priority health, public health, and environmental issues facing us this session and beyond. Awards will also be presented to Senators Ed Kasemeyer, Rich Madeleno, and Nathaniel McFadden and Delegates Adrienne Jones, Maggie McIntosh, and Craig Zucker, and an as-yet-not-announced MdPHA Fedder Legislator of the Year.